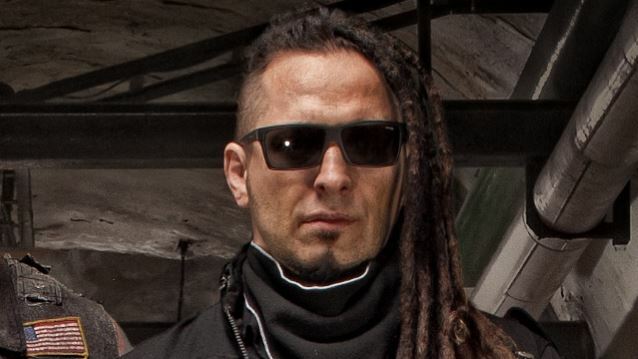 Five Finger Death Punch News: Zoltan Bathory on 'And Justice For None': "This record has three or four of the biggest songs we ever wrote"
Zoltan Bathory on 'And Justice For None': "This record has three or four of the biggest songs we ever wrote"
Meltdown of Detroit's WRIF radio station recently conducted an interview with Zoltan Bathory. You can read some excerpts below. On the delay in getting Five Finger Death Punch's new album, "And Justice For None", released after being embroiled in a lawsuit with the band's record company, Prospect Park, Zoltan said: "Everybody knows we were in this crazy situation last year, and actually, that's how the album title came about. When you're in a lawsuit, the only people that win are pretty much the lawyers. There was this back-and-forth forever, and finally when we settled, I think Ivan Moody was the one who said, 'Well, I guess that's justice for none.' And we were, like, 'Let's call the album 'And Justice For None'.' Even though we all know there's Metallica album [called '…And Justice For All'], obviously, out there. And lyrics, actually, Metallica's '…And Justice For All', make a lot of sense to me. The same crap 30 years later, right?" On whether Five Finger Death Punch went back and touched up any parts of "And Justice For None" after the original version of the album was completed in December 2016: "The thing about music today and the technology today is you can kind of keep polishing things, working on things up until the last day — up until the very last day that you have to submit the record, you still can change things, so you can still touch things up and move things around. The music kind of stayed almost as is — there were just a couple of things that we did — and we ended up recording a couple of more songs that was part of the agreement with the label; we recorded three more songs for the album that was part the settlement. And we ended up shaking hands and everybody's fine. It just kind of took a year out of our schedule." On the "And Justice For None" album cover: "In my whole life, I always wanted to design an album cover that gets censored. This album cover, in Europe, created such a chaos. I'm not even gonna mention what countries, but oh my God! I mean, it was complete chaos. Getting back the news from Europe, like, okay, we're gonna have to have a sticker across the album cover, because in certain countries, this became a problem. A cartoon character pushing a red button became a problem, that, 'Ooh, this is politically incorrect, so we're gonna have to censor the album cover.' I mean, it was absolute insanity." On the musical direction of "And Justice For None": "You pick any band — let's say Iron Maiden. Iron Maiden has a sound, and anytime a new Iron Maiden album comes out, you're gonna get an Iron Maiden record; it's never gonna sound anything else but Iron Maiden. And I think, not to compare us to Iron Maiden, Five Finger Death Punch kind of have a sound; you hear it on the radio and you know it's us. So we have a sound, and we're not gonna really go far away from that. We sometimes experiment, but we have a sound. And for us, it's always about writing the song — the song is what matters the most to us. If you stick with your instrument and you practice all day, you're gonna be great at it — mechanically, you're a good musician. But that's not songwriting. Songwriting is when you can write a song that becomes the soundtrack to people's lives. Music affects you in a certain way; there are songs that you listen to and you know where you were when you heard it the first time. Or what was the summer when this was the song on the radio; you remember those things. There are only a handful of those songs in the world that have that impact on you: 'Yeah, I remember, and I know how I felt. I remember how life was when this song was on the radio.' And if you, in your career as a musician, can write one of those songs, then I think you succeeded, 'cause that's what matters. Can I write a song that really means something to people? And that's what it is about. And I think this record has three or four, probably, of the biggest songs we ever wrote, and that's what matters to us. When you're listening to this album, there are some songs that, in my opinion, are just massive songs that are really going to hit some chords with a lot of people."